In third party logistics "public warehousing" and "contract warehousing" are common terms. Do you know the difference between them? Did you know "contract warehousing" is a form of public warehousing? We are starting an educational series of posts today with the basic differences between contract and public warehousing as referenced by most 3PL service providers. There are some key differences that should be considered when looking to store your product. To begin with the most basic point: Private Warehousing is an endeavor undertaken by a company, often a manufacturer, to store their own product. The company chooses to absorb all the costs associated and may keep the product on or off-site. Henry Ford is a great example of an innovator who preferred private warehousing. When he expanded the Ford company to begin sourcing his own steel, he had to simultaneously find a place to store it. Ford chose to keep it all under a single company name and expanded Ford Motor company to handle his warehousing. Public Warehousing then is any storage of product by an outside third party. We do not own the product but take on the responsibility of properly handling and inventorying it; investing our capital in the equipment, personnel, and building. 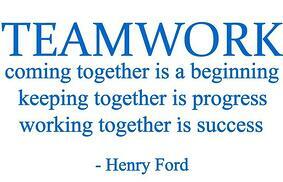 As a third party logistics company, everything Spartan Logistics does falls under this banner. When we meet with clients however, public warehousing takes on a new meaning. Public warehouse space is floor space available for anyone to store anything. Historically, this is usually a pallet in/pallet out setup with a monthly square footage rate. Public warehousing in the 3pl world is like an apartment rented on a month to month basis. It works well for short term overflow or seasonal swings in supply and demand. There is not usually a lot of rework or value-added services provided at this level, although that can be setup. The fee schedule is also straight forward. A charge for receiving and/or shipping and the square footage used while the product is in. Of note, public warehousing is a first come, first served basis. If the warehouse is full, then you will need to find another place to store your product. The flip side of that is increased flexibility. If you are using 10,000 sq ft. this month but plan to have all but 2,000 sq ft. shipped out by April; then you are paying for 10,000 sq ft. this month and only 2,000 sq ft next month. Contract warehousing takes away the flexibility of public warehousing, but you gain a guarantee. Whether the space is full or empty, the square footage you contracted is yours. Spartan Logistics will not fill that space with anyone else's product while waiting to receive your goods in. It will be available to you whenever you need. Contract warehousing is also commonly used to fulfill more intricate customer needs. If pallets need to be reworked, a pick and pack order fulfillment setup, or specific quality checks performed, a contract warehousing agreement is the way to go. Scope of work needed can be determined and setup within the contract, serving to ensure both client and Spartan meet the requirements. Most contract warehousing setups are long term, 3-5 years. In part this ensures Spartan's investment to fulfill the client needs whether special equipment, trained personnel, or technology solutions results in a profit for both. TheVenn diagram makes note of a simplified invoice. With contract warehousing, everything is spelled out in the contract so the monthly or weekly invoices should be fairly similar one to another, leaving no surprises. Spartan Logistics strives to keep surprises at a minimum. We want to help you grow and meet your goals. Whether you need a little extra floor space to bring in some new machinery or you are looking to expand your inventory but have run out of room, we can help. Our passionate team members are committed to customer service, respect, and integrity because we believe these qualities are necessary to building the relationships that allow all of us to flourish. Continuing education keeps business running smoothly. 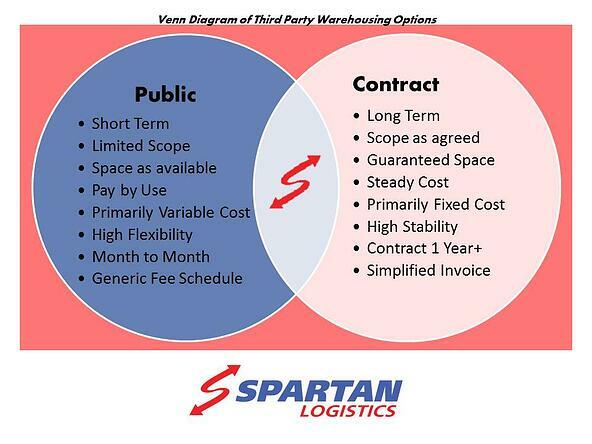 Check back next month for the next post in Spartan's series on common questions in 3PL. In the meantime, contact us if you would like to work together. Have a question you would like answered? Leave a comment below.